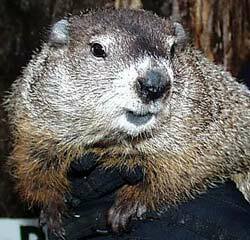 And to all the groundhogs who are giving their weather predictions today, especially Gertie at the Wildlife Prairie State Park in Illinois. What an exciting day for these all-American mammals! In Europe there was a similar tradition with hedgehogs, though I am not sure it is still celebrated...and certainly not with parades and speeches by the local mayor. Their coats are thick, soft fur and they have front paws almost like hands (sort of like a raccoon). To learn more about groundhogs, and even hear a selection of sounds they make, visit Hog Haven. In 2008 I wrote a post about my pet groundhog Charlie. He was a great guy, and I still like to remember him snuggled in my lap, making a contented little woodchuck grunting sound. I always wanted to make a Groundhog Quilt, but didn't really want to use the Sunshine & Shadows block for it. Shayla was so happy on this top she didn't make a face when I snapped the picture! May the shadows that fall on your life soon be gone. and remember the Groundhog is always your friend! Love Shayla's come hither pose!